Reconciling petrophysics to geology through integrated workflow. 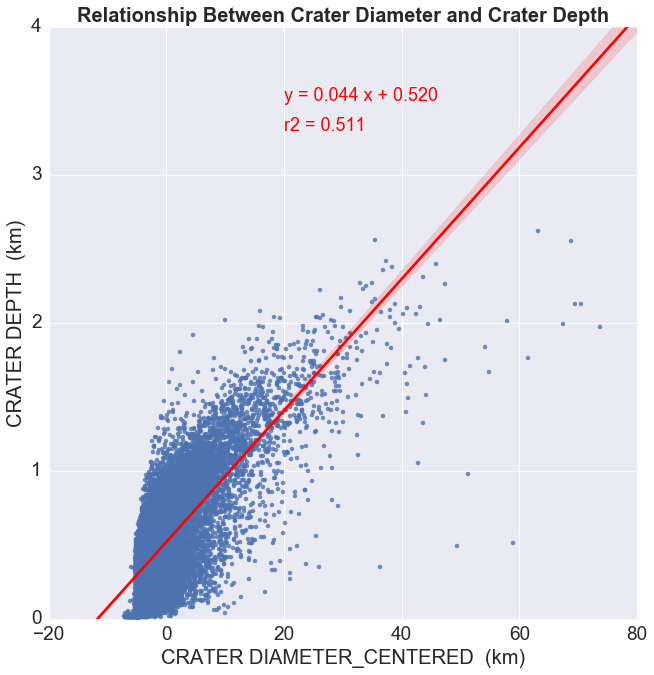 This week, I am going to test a basic linear regression model for the association between Crater Diameter (explanatory variable) and Crater Depth (response variable). The explanatory and response variables are both quantitative. Therefore, I will center the explanatory variable (Crater Diameter) to have a mean of zero. 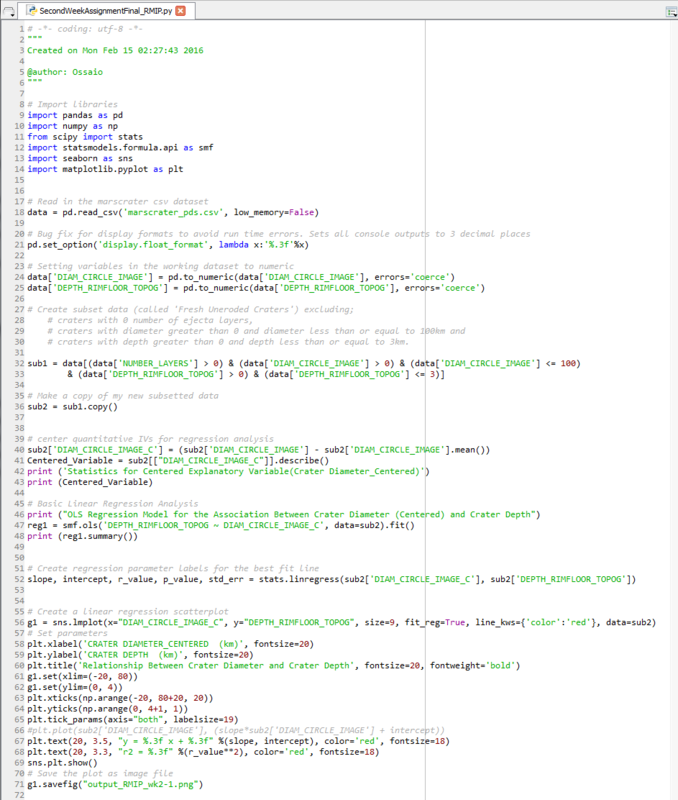 Below are the python code used in the regression analysis and a brief report to summarize the results of the regression model. The table above shows the descriptive statistics of the centered explanatory variable (Crater Diameter_Centered). It has a mean of zero indicating that the variable was properly centered. The results of the linear regression model indicated that Crater Diameter (Beta = 0.0444, p < 0.0001) was significantly and positively associated with Crater Depth. The table above shows a high F-statistic (1.885 e+04). A very low p-value < 0.0001 indicates that the association of Crater Diameter with Crater Depth is statistically significant. 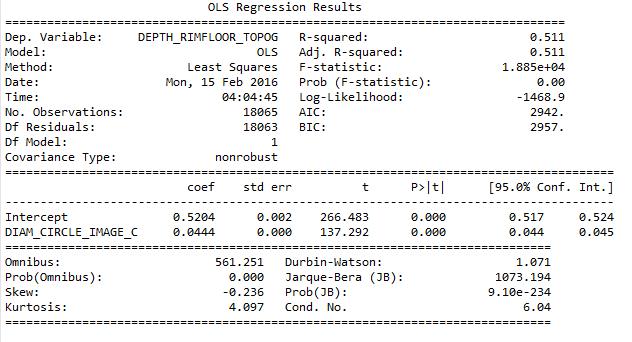 The regression model has an intercept of 0.5204 and a slope (regression coefficient) of 0.0444. An R-squared of 0.511 suggests that if we know crater diameter, we can predict 51% of the variability observed in crater depth while 49% variability will be unaccounted for. This means we can predict over half of the variability. Posted in Regression Modeling in Practice Course. © 2019 PetroSai Integrated Petroleum Services Ltd. All rights reserved.